For the 2014 film, see Diving Bell (film). Not to be confused with Bathysphere. Transport of surface supplied and saturation divers from the surface to the underwater workplace and back. A diving bell is a rigid chamber used to transport divers from the surface to depth and back in open water, usually for the purpose of performing underwater work. The most common types are the open bottomed wet bell and the closed bell, which can maintain an internal pressure greater than the external ambient. Diving bells are usually suspended by a cable, and lifted and lowered by a winch from a surface support platform. Unlike a submersible, the diving bell is not designed to move under the control of its occupants, nor to operate independently of its launch and recovery system. A submersible is a small vehicle designed to operate underwater. The term submersible is often used to differentiate from other underwater vehicles known as submarines, in that a submarine is a fully autonomous craft, capable of renewing its own power and breathing air, whereas a submersible is usually supported by a surface vessel, platform, shore team or sometimes a larger submarine. In common usage by the general public, however, the word submarine may be used to describe a craft that is by the technical definition actually a submersible. There are many types of submersibles, including both crewed and uncrewed craft, otherwise known as remotely operated vehicles or ROVs. Submersibles have many uses worldwide, such as oceanography, underwater archaeology, ocean exploration, adventure, equipment maintenance and recovery, and underwater videography. The wet bell is a structure with an airtight chamber which is open to the water at the bottom, that is lowered underwater to operate as a base or a means of transport for a small number of divers. Air is trapped inside the bell by pressure of the water at the interface. These were the first type of diving chamber, and are still in use in modified form. Underwater refers to the region below the surface of water where the water exists in a swimming pool or a natural feature such as an ocean, sea, lake, pond, or river. A diving chamber is a vessel for human occupation, which may have an entrance that can be sealed to hold an internal pressure significantly higher than ambient pressure, a pressurised gas system to control the internal pressure, and a supply of breathing gas for the occupants. The closed bell is a pressure vessel for human occupation, which may be used for bounce diving or saturation diving, with access to the water through a hatch at the bottom. The hatch is sealed before ascent to retain internal pressure. At the surface, this type of bell can lock on to a hyperbaric chamber where the divers live under saturation or are decompressed. The bell is mated with the chamber system via the bottom hatchway or a side hatchway, and the trunking in between is pressurized to enable the divers to transfer through to the chamber under pressure. In saturation diving the bell is merely the ride to and from the job, and the chamber system is the living quarters. If the dive is relatively short (a bounce dive), decompression can be done in the bell in exactly the same way it would be done in the chamber. Saturation diving is a diving technique that allows divers to reduce the risk of decompression sickness when they work at great depths for long periods of time. Saturation divers typically breathe a helium–oxygen mixture to prevent nitrogen narcosis. 16th century Islamic painting of Alexander the Great lowered in a glass diving bell. Sir William Phipps used a diving bell to salvage tremendous wealth from a sunken Spanish treasure ship. The diving bell is one of the earliest types of equipment for underwater work and exploration. Its use was first described by Aristotle in the 4th century BC: "...they enable the divers to respire equally well by letting down a cauldron, for this does not fill with water, but retains the air, for it is forced straight down into the water." According to Roger Bacon, Alexander the Great explored the Mediterranean on the authority of Ethicus the astronomer. In 1535, Guglielmo de Lorena created and used what is considered to be the first modern diving bell. Aristotle was an ancient Greek philosopher and scientist born in the city of Stagira, Chalkidiki, Greece. Along with Plato, he is considered the "Father of Western Philosophy". Aristotle provided a complex and harmonious synthesis of the various existing philosophies prior to him, including those of Socrates and Plato, and it was above all from his teachings that the West inherited its fundamental intellectual lexicon, as well as problems and methods of inquiry. As a result, his philosophy has exerted a unique influence on almost every form of knowledge in the West and it continues to be central to the contemporary philosophical discussion. Roger Bacon, also known by the scholastic accolade Doctor Mirabilis, was a medieval English philosopher and Franciscan friar who placed considerable emphasis on the study of nature through empiricism. In the early modern era, he was regarded as a wizard and particularly famed for the story of his mechanical or necromantic brazen head. He is sometimes credited as one of the earliest European advocates of the modern scientific method inspired by Aristotle and by the Arab scientist Alhazen. 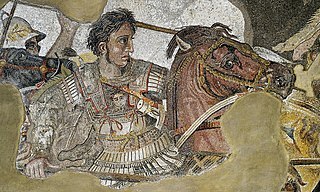 Alexander III of Macedon, commonly known as Alexander the Great, was a king (basileus) of the ancient Greek kingdom of Macedon and a member of the Argead dynasty. He was born in Pella in 356 BC and succeeded his father Philip II to the throne at the age of 20. He spent most of his ruling years on an unprecedented military campaign through Asia and northeast Africa, and by the age of thirty he had created one of the largest empires of the ancient world, stretching from Greece to northwestern India. He was undefeated in battle and is widely considered one of history's most successful military commanders. Franz Kessler was a portrait painter, scholar, inventor and alchemist living in the Holy Roman Empire during the 16th and 17th centuries. 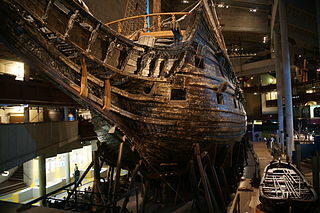 Vasa is a retired Swedish warship built between 1626 and 1628. The ship foundered after sailing about 1,300 m into its maiden voyage on 10 August 1628. It fell into obscurity after most of her valuable bronze cannons were salvaged in the 17th century until she was located again in the late 1950s in a busy shipping lane just outside the Stockholm harbor. Salvaged with a largely intact hull in 1961, it was housed in a temporary museum called Wasavarvet until 1988 and then moved permanently to the Vasa Museum in the Royal National City Park in Stockholm. The ship is one of Sweden's most popular tourist attractions and has been seen by over 35 million visitors since 1961. Since her recovery, Vasa has become a widely recognised symbol of the Swedish 'great power period' and is today a de facto standard in the media and among Swedes for evaluating the historical importance of shipwrecks. The bell is lowered into the water by cables from a crane, gantry or A-frame attached to a floating platform or shore structure. The bell is ballasted so as to remain upright in the water and to be negatively buoyant, so that it will sink even when full of air. Fresh gas is available for breathing by the occupants. Volume reduction of the air in an open bell due to increasing hydrostatic pressure as the bell is lowered is compensated. Adding pressurized gas ensures that the gas space within the bell remains at constant volume as the bell descends in the water.Otherwise the bell would partially fill with water as the gas was compressed. 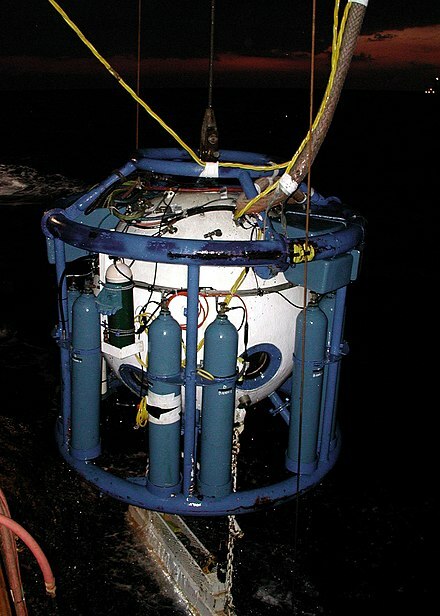 The physics of the diving bell applies also to an underwater habitat equipped with a moon pool, which is like a diving bell enlarged to the size of a room or two, and with the water–air interface at the bottom confined to a section rather than forming the entire bottom of the structure. A wet bell is a platform for lowering and lifting divers to and from the underwater workplace, which has an air filled space, open at the bottom where the divers can stand or sit with their heads out of the water. The air space is at ambient pressure at all times, so there are no great pressure differences, and the greatest structural loads are usually self weight and the buoyancy of the air space. A fairly heavy ballast is often required to counteract the buoyancy of the airspace, and this is usually set low at the bottom of the bell, which helps with stability. The base of the bell is usually a grating or deck which the divers can stand on, and folding seats may be fitted for the divers' comfort during ascent, as in-water decompression may be long. Other equipment that is carried on the bell include cylinders with the emergency gas supply, and racks or boxes for tools and equipment to be used on the job. The type 1 wet bell does not have an umbilical supplying the bell. Umbilicals supply the divers directly from the surface, similar to a diving stage. 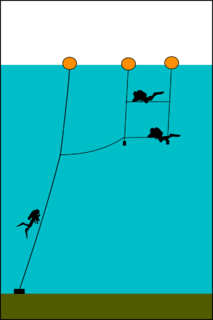 Divers deploying from a type 1 bell will exit on the opposite side to where the umbilicals enter the bell so that the umbilicals pass through the bell and the divers can find their way back to the bell at all times by following the umbilical. Bailout from a type 1 bell is done by exiting the bell on the side that the umbilicals enter the bell so they no longer pass through the bell, leaving the divers free to surface. A gas panel inside the bell is supplied by the bell umbilical and the emergency gas cylinders, and supplies the divers' umbilicals and sometimes BIBS sets. There will be racks to hang the divers' umbilicals, which for this application must not be buoyant. The bell with divers on board is deployed from the working platform (usually a vessel) by a crane, davit or other mechanism with a man-rated winch. The bell is lowered into the water and to the working depth at a rate recommended by the decompression schedule, and which allows the divers to equalize comfortably. Wet bells with an air space will have the air space topped up as the bell descends and the air is compressed by increasing hydrostatic pressure. The air will also be refreshed as required to keep the carbon dioxide level acceptable to the occupants. The oxygen content is also replenished, but this is not the limiting factor, as the oxygen partial pressure will be higher than in surface air due to the depth. When the bell is raised, the pressure will drop and excess air due to expansion will automatically spill under the edges. If the divers are breathing from the bell airspace at the time, it may need to be vented with additional air to maintain a low carbon dioxide level. The decrease in pressure is proportional to the depth as the airspace is at ambient pressure, and the ascent must be conducted according to the planned decompression schedule appropriate to the depth and duration of the diving operation. A closed or dry bell is basically a pressure vessel for human occupation which is lowered into the sea to the workplace, equalised in pressure to the environment, and opened to allow the divers in and out. These functional requirements dictate the structure and arrangement. The internal pressure requires a strong structure, and a sphere or spherical ended cylinder is most efficient for this purpose. When the bell is underwater, it must be possible for the occupants to get in or out without flooding the entire interior. This requires a pressure hatch at the bottom. The requirement that the bell retains its internal pressure when the external pressure is lowered dictates that the hatch opens inward, so that internal pressure will hold it closed. Locking onto a decompression chamber at the surface is possible either from the bottom or the side. Using the bell bottom hatch for this purpose has the advantage of only needing one hatch, and the disadvantage of having to lift the bell up and place it over a vertical entry to the chamber. The bell bottom hatch must be large enough for a large diver fully kitted with appropriate bailout cylinders, to get in and out without undue difficulty, and it can not be closed while the diver is outside as the umbilical is tended through the hatch by the bellman. It must also be possible for the bellman to lift the working diver in through the hatch if he is unconscious, and close the hatch after him, so that the bell can be raised and pressurised for the ascent. A lifting tackle is usually fitted inside the bell for this purpose, and the bell may be partially flooded to assist the procedure. The internal space must be large enough for a fully kitted diver and bellman (the stand-by diver responsible for manning the bell while the working diver is locked out) to sit, and for their umbilicals to be stowed neatly on racks, and the hatch to be opened inwards while they are inside. Anything bigger will make the bell heavier than it really needs to be, so all equipment that does not need to be inside is mounted outside. This includes a framework to support the ancillary equipment and protect the bell from impact and snagging on obstacles,and the emergency gas supply, which is usually racked around the framework and connected via manifolds to the internal gas panel. The part of the framework that keeps the lower hatch off the bottom is called the bell stage. It may be removable. The bell umbilical is connected to the bell via through hull fittings (hull penetrations), which must withstand all operating pressures without leaking. The internal gas panel connects to the hull penetrations and the diver's umbilicals. The umbilicals will carry main breathing gas supply, a communications cable, a pneumofathometer hose, hot water supply for suit heating, power for helmet mounted lights, and possibly gas reclaim hose and video cable. The bell umbilical will usually also carry a power cable for internal and external bell lighting. Hydraulic power lines for tools do not have to pass into the interior of the bell as they will never be used there, and tools can also be stored outside. There may be an emergency through-water communications system with a battery power supply, and a location transponder working on the international standard 37.5 kHz. The bell may also have viewports and a medical lock. Wet bell handling differs from closed bell handling in that there is no requirement to transfer the bell to and from the chamber system to make a pressure-tight connection, and that a wet bell will be required to maintain a finely controlled speed of descent and ascent and remain at a fixed depth within fairly close tolerances for the occupants to decompress at a specific ambient pressure, whereas a closed bell can be removed from the water without delay and the speed of ascent and descent is not critical. Commercial diving operators now generally use a closed bell in conjunction with a surface hyperbaric chamber, These have safety and ergonomic advantages and allow decompression to be carried out after the bell has been raised to the surface and back on board the diving support vessel. Closed bells are often used in saturation diving and undersea rescue operations. The diving bell would be connected via the mating flange of an airlock to the deck decompression chamber or saturation system for transfer under pressure of the occupants. Diving bells have been used for submarine rescue. The closed dry bell is designed to seal against the deck of the submarine above an escape hatch. Water in the space between the bell and the submarine is pumped out and the hatches can be opened to allow occupants to leave the submarine and enter the bell. The hatches are then closed, the bell skirt flooded to release it from the submarine, and the bell with its load of survivors is hoisted back to the surface, where the survivors exit and the bell may return for the next group. The internal pressure in the bell is usually kept at atmospheric pressure to minimise run time by eliminating the need for decompression, so the seal between the bell skirt and the submarine deck is critical to the safety of the operation. This seal is provided by using a flexible sealing material, usually a type of rubber, which is pressed firmly against the smooth hatch surround by the pressure differential when the skirt is pumped out. As noted above, further extension of the wet bell concept is the moon-pool-equipped underwater habitat, where divers may spend long periods in dry comfort while acclimated to the increased pressure experienced underwater. By not needing to return to the surface between excursions into the water, they can reduce the necessity for decompression (gradual reduction of pressure), after each excursion, required to avoid problems with nitrogen bubbles releasing from the bloodstream (the bends, also known as caisson disease). Such problems can occur at pressures greater than 1.6 standard atmospheres (160 kPa), corresponding to a depth of 6 metres (20 ft) of water. Divers in an ambient pressure habitat will require decompression when they return to the surface. This is a form of saturation diving. The diving bell spider, Argyroneta aquatica, is a spider which lives entirely under water, even though it could survive on land. Since the spider must breathe air, it constructs from silk a habitat like an open diving bell which it attaches to an underwater plant. The spider collects air in a thin layer around its body, trapped by dense hairs on its abdomen and legs. It transports this air to its diving bell to replenish the air supply in the bell. This allows the spider to remain in the bell for long periods, where it waits for its prey. A scuba set is any breathing apparatus that is carried entirely by an underwater diver and provides the diver with breathing gas at the ambient pressure. Scuba is an anacronym for self-contained underwater breathing apparatus. Although strictly speaking the scuba set is only the diving equipment which is required for providing breathing gas to the diver, general usage includes the harness by which it is carried, and those accessories which are integral parts of the harness and breathing apparatus assembly, such as a jacket or wing style buoyancy compensator and instruments mounted in a combined housing with the pressure gauge, and in the looser sense it has been used to refer to any diving equipment used by the scuba diver, though this would more commonly and accurately be termed scuba equipment or scuba gear. Scuba is overwhelmingly the most common underwater breathing system used by recreational divers and is also used in professional diving when it provides advantages, usually of mobility and range, over surface supplied diving systems, and is allowed by the relevant code of practice. Surface-supplied diving is diving using equipment supplied with breathing gas using a diver's umbilical from the surface, either from the shore or from a diving support vessel, sometimes indirectly via a diving bell. This is different from scuba diving, where the diver's breathing equipment is completely self-contained and there is no link to the surface. The primary advantages of conventional surface supplied diving are lower risk of drowning and considerably larger breathing gas supply than scuba, allowing longer working periods and safer decompression. Scuba diving is a mode of underwater diving where the diver uses a self-contained underwater breathing apparatus (scuba), which is completely independent of surface supply, to breathe underwater. Scuba divers carry their own source of breathing gas, usually compressed air, allowing them greater independence and freedom of movement than surface-supplied divers, and longer underwater endurance than breath-hold divers. Open circuit scuba systems discharge the breathing gas into the environment as it is exhaled, and consist of one or more diving cylinders containing breathing gas at high pressure which is supplied to the diver through a regulator. They may include additional cylinders for range extension, decompression gas or emergency breathing gas. Closed-circuit or semi-closed circuit rebreather scuba systems allow recycling of exhaled gases. The volume of gas used is reduced compared to that of open circuit, so a smaller cylinder or cylinders may be used for an equivalent dive duration. Rebreathers extend the time spent underwater compared to open circuit for the same gas consumption; they produce fewer bubbles and less noise than open circuit scuba which makes them attractive to covert military divers to avoid detection, scientific divers to avoid disturbing marine animals, and media divers to avoid bubble interference. Diver rescue, following an accident, is the process of avoiding or limiting further exposure to diving hazards and bringing a diver to a place of safety. A safe place is often a place where the diver cannot drown, such as a boat or dry land, where first aid can be administered and from which professional medical treatment can be sought. In the context of surface supplied diving, the place of safety for a diver with a decompression obligation is often the diving bell. An umbilical cable or umbilical is a cable and/or hose that supplies required consumables to an apparatus, diver or astronaut. It is named by analogy with an umbilical cord. An umbilical can, for example, supply air and power to a pressure suit or hydraulic power, electrical power and fiber optics to subsea equipment and divers. Underwater diving, as a human activity, is the practice of descending below the water's surface to interact with the environment. Immersion in water and exposure to high ambient pressure have physiological effects that limit the depths and duration possible in ambient pressure diving. Humans are not physiologically and anatomically well adapted to the environmental conditions of diving, and various equipment has been developed to extend the depth and duration of human dives, and allow different types of work to be done. In underwater diving, an alternative air source, or more generally alternative breathing gas source, is a secondary supply of air or other breathing gas for use by the diver in an emergency. Examples include an auxiliary demand valve, a pony bottle and bailout bottle. Diving equipment is equipment used by underwater divers to make diving activities possible, easier, safer and/or more comfortable. This may be equipment primarily intended for this purpose, or equipment intended for other purposes which is found to be suitable for diving use. In underwater diving, ascending and descending is done using strict protocols to avoid problems caused by the changes in ambient pressure and the hazards of obstacles near the surface or collision with vessels. Diver certification and accreditation organisations place importance on these protocols early in their diver training programmes. Commercial offshore diving, sometimes shortened to just offshore diving, is a branch of commercial diving, with divers working in support of the exploration and production sector of the oil and gas industry in places such as the Gulf of Mexico in the United States, the North Sea in the United Kingdom and Norway, and along the coast of Brazil. The work in this area of the industry includes maintenance of oil platforms and the building of underwater structures. In this context "offshore" implies that the diving work is done outside of national boundaries. An emergency ascent is an ascent to the surface by a diver in an emergency. More specifically it refers to any of several procedures for reaching the surface in the event of an out-of-air emergency, generally while scuba diving. This is a glossary of technical terms, jargon, diver slang and acronyms used in underwater diving. The definitions listed are in the context of underwater diving. There may be other meanings in other contexts. Dive planning is the process of planning an underwater diving operation. The purpose of dive planning is to increase the probability that a dive will be completed safely and the goals achieved. Some form of planning is done for most underwater dives, but the complexity and detail considered may vary enormously. The practice of decompression by divers comprises the planning and monitoring of the profile indicated by the algorithms or tables of the chosen decompression model, to allow asymptomatic and harmless release of excess inert gases dissolved in the tissues as a result of breathing at ambient pressures greater than surface atmospheric pressure, the equipment available and appropriate to the circumstances of the dive, and the procedures authorized for the equipment and profile to be used. There is a large range of options in all of these aspects. There are several categories of decompression equipment used to help divers decompress, which is the process required to allow divers to return to the surface safely after spending time underwater at higher pressures. Surface supplied diving skills are the skills and procedures required for the safe operation and use of surface-supplied diving equipment. Besides these skills, which may be categorised as standard operating procedures, emergency procedures and rescue procedures, there are the actual working skills required to do the job, and the procedures for safe operation of the work equipment other than diving equipment that may be needed. A diving team is a group of people who conduct a diving operation. A characteristic of professional diving is the specification for minimum personnel for the diving support team. This typically specifies the minimum number of support team members and their appointed responsibilities in the team based on the circumstances and mode of diving, and the minimum qualifications for specified members of the diving support team. The minimum team requirements may be specified by regulation or code of practice. Specific appointments within a dive team for which competences are specified and registration may be required are listed below. 1 2 Staff. "Modern diving bells and chambers". divingheritage.com. Diving Heritage. Retrieved 22 February 2017. ↑ Bevan, J. (1999). "Diving bells through the centuries". South Pacific Underwater Medicine Society Journal. 29 (1). ISSN 0813-1988. OCLC 16986801 . Retrieved 2008-04-25. ↑ Bachrach, Arthur J. (Spring 1998). "History of the Diving Bell". Historical Diving Times (21). 1 2 Davis, RH (1955). Deep Diving and Submarine Operations (6th ed.). Tolworth, Surbiton, Surrey: Siebe Gorman & Company Ltd. p. 693. ↑ Staff. "Timeline: 1663-1665 Fishing for cannons". www.vasamuseet.se. Vasa Museet. Retrieved 13 May 2017. ↑ "The Life of Sir William Phips Chapter 1: Spanish Treasure". Spanish Treasure and the Canada Townships. New Boston Historical Society. Retrieved 3 October 2016. ↑ Acott, C (1999). "A brief history of diving and decompression illness". South Pacific Underwater Medicine Society Journal. 29 (2). ISSN 0813-1988. OCLC 16986801 . Retrieved 2009-03-17. ↑ Edmonds, Carl; Lowry, C; Pennefather, John (1975). "History of diving". South Pacific Underwater Medicine Society Journal. 5 (2). Retrieved 2012-11-26. 1 2 Kilfeather, Siobhan Marie (2005). Dublin: A Cultural History. Oxford University Press. p. 63. ISBN 9780195182019. 1 2 3 4 5 6 7 8 Staff (August 2016). "13 - Closed bell diving". Guidance for diving supervisors IMCA D 022 (Revision 1 ed.). London, UK: International Marine Contractors Association. pp. 13&#45, 5. ↑ "Diving & Life Support: Analox HC Monitors - HYPER-GAS MKII". www.uniquegroup.com. Retrieved 5 December 2017. ↑ "Hypergas Mk II Hyperbaric HC Monitor" (PDF). www.analoxsensortechnology.com. Retrieved 5 December 2017. ↑ Johns, Vic. "British Mini bell system". divingheritage.com. Diving Heritage. Retrieved 22 February 2017. 1 2 3 4 Bevan, John, ed. (2005). "Section 5.1". The Professional Divers's Handbook (second ed.). 5 Nepean Close, Alverstoke, GOSPORT, Hampshire PO12 2BH: Submex Ltd. p. 200. ISBN 978-0950824260. Wikimedia Commons has media related to Diving bells .